The working principle is the same as for a fridge, freezer or an A/C unit. A heat pump has a closed circulation of special cooling fluid that evaporates under low temperatures and absorbs energy. Steam is compressed by a compressor and thus heated. Under a higher temperature the steam transfers its heat to the heating water, turns to fluid and the cycle repeats. Like a freezer can take heat from food even at -20 °C, a heat pump can operate and take heat from air or ground even at so extremely low temperatures. A Coefficient of Performance (C.O.P.) of a heat pump shows the efficiency of its operation. 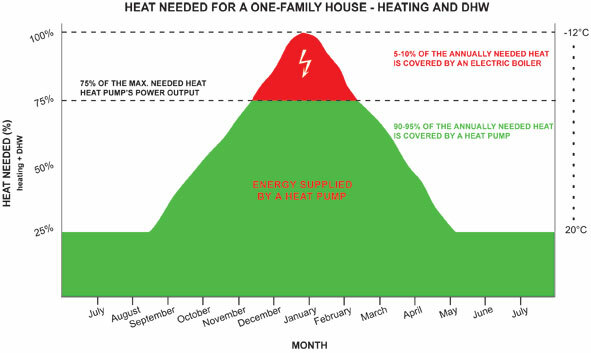 It shows how many times more energy a heat pump supplies than it consumes. A C.O.P. sinks with the sinking temperature of the heat source. Under our conditions, air is the most current heat source for heat pumps. The advantage is an easy installation, requiring no ground bores. For ground-coupled heat pumps, either deep bores or a ground collector buried about 1.2m below the ground surface are necessary. The C.O.P. does not sink even under strong frost because the ground has a stable temperature. A traditional heat source (a boiler) shall be of a power output equal to or higher than the heat loss from the specific house. Since the investment into a more powerful heat pump is rather high, a heat pump of a lower power output is usually selected. 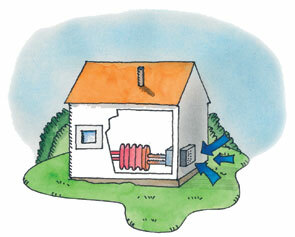 Under extremely cold weather a heat pump is supported by traditional heat sources – electricity, gas, solid fuel etc. Since the number of very cold days is rather limited, the costs of operation of a traditional heat source are small but the spared investment is high. We recommend using a heat pump of a power output reaching about 70% of a house‘s Heating system heat loss that will cover up to 95% of its annual heat needs. 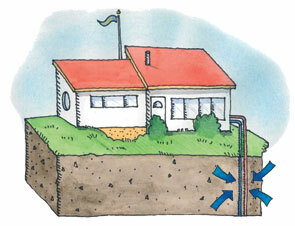 A low-temperature heating system (underfloor heating, wall heating etc) is the best for utilizing a heat pump. A low-temperature heating system will heat your house to a comfortable temperature even with a low-temperature heating water. The lower temperature your heating system requires, the more money you save when using a heat pump for heating. Our technicians are ready to design a nonbinding, tailor-made solution for your needs. We are able to supply a solution not only for small one-family houses, but also for large commercial buildings. Up-to-date information is available on our web pages concerning the state subsidies for private persons as well as grants for non-business entities within the frame of EU Operational Programmers.